Hard on the heels of the Alpha Magnetic Spectrometer (AMS) positron excess and possible dark matter report, we now have a hint of direct dark matter detection from the SuperCDMS Collaboration this month. 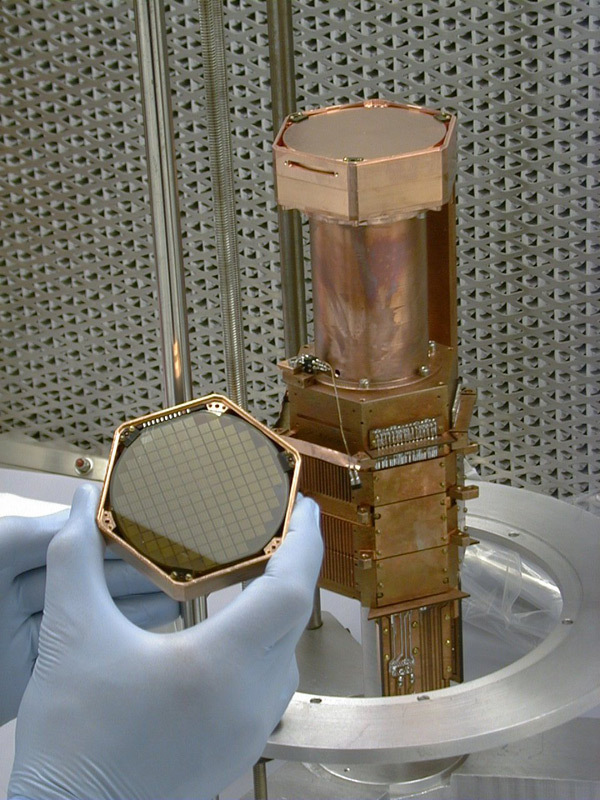 A recent blog here on darkmatterdarkenergy.com discusses the detection of excess positron flux seen in the AMS-02 experiment on board the Space Shuttle. The two main hypotheses for the source of excess positrons are either a nearby pulsar or dark matter in our Milky Way galaxy and halo. 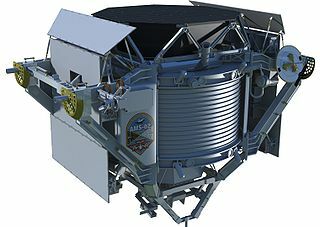 CDMS-II (CDMS stands for Cryogenic Dark Matter Search) is a direct dark matter detection experiment based in the Soudan mine in Minnesota. The deep underground location shields the experiment from most of the cosmic rays impinging on the Earth’s surface. Previously they had reported a null result based on their germanium detector and ruled out a detection. Now they have more completely analyzed data from their silicon detector, which has higher sensitivity for lower possible dark matter masses, and they have detected 3 events which might be due to dark matter and report as follows. So essentially they are reporting a possible detection with something ranging from 95% to 99.8% likelihood. This is a hint, but cannot be considered a firm detection as it rises to the level of perhaps 3 standard deviations (3 sigma) of statistical significance. Normally one looks to see a 5 sigma significance for a detection to be well confirmed. If the 3 events are real they suggest a relatively low dark matter particle mass of around 8 or 9 GeV/c² (the proton mass is a little under 1 GeV/c², and the Higgs boson around 126 GeV/c²). 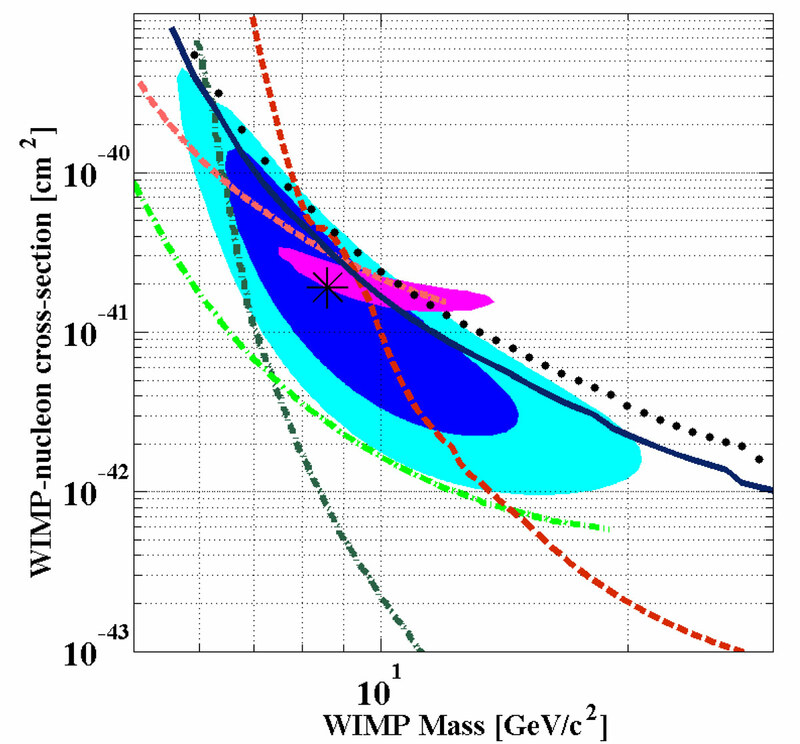 Figure: Error ellipses for CDMS-II and CoGeNT, assuming a dark matter WIMP explanation. Blue ellipses are the 68% (dark blue) and 90% (cyan) confidence levels for the CDMS-II experiment. The purple ellipse is the 90% confidence level for CoGeNT. The figure shows the plane of dark matter (WIMP, or weakly interacting massive particle) cross-section on the y-axis vs. the WIMP mass on the x-axis. Note this is a log-log plot, so the uncertainties are large. The dark blue region is the 1 sigma error ellipse for the CDMS experiment and the light blue region is the 90% confidence error ellipse. The best fit is marked by an asterisk located at mass of 8.6 GeV/c² and with a cross-section a bit under 2 x 10^-41 cm². But the mass could range from less than 6 to as much as 20 or more GeV/c². And the cross-section uncertainty is over two orders of magnitude. However, this is quite interesting as the error ellipse for the mass and interaction cross-section from this CDMS-II putative result overlaps well with the (smaller) error ellipse of the CoGeNT results. The CoGeNT experiment is a germanium detector run by a different consortium, but based in the same Soudan Underground Laboratory as the CDMS-II experiment! COGENT sees a possible signal with around 2.8 sigma significance as an annual modulated WIMP wind, with the modulation in the signal due to the Earth’s motion around the Sun and thus relative to the galactic center. The purple colored region in the figure is the CoGeNT 90% confidence error ellipse, and it includes the CDMS-II best fit point and suggests also a mass of roughly 10 GeV/c². The DAMA/LIBRA experiment in Italy has for years been claiming a highly significant 9 sigma detection of a WIMP (dark matter) wind, but with very large uncertainties in the particle mass and cross-section. However both the COGENT results and this CDMS-II possible result are quite consistent with the centroid of the DAMA/LIBRA error regions. And both the CoGeNT and DAMA experiments are consistent with an annual modulation peak occurring sometime between late April and the end of May, as is expected based on the Earth’s orbit combined with the Sun’s movement relative to the galactic center. What we can say at this point is the hottest region to hunt in is around 6 to 10 GeV/c² and with a cross section roughly 10^-41 cm². Physicists may be closing in on the target area for a confirmed weakly interacting dark matter particle detection. We await further results, but the pace of progress seems to be increasing. AMS Positron Excess: Due to Dark Matter or not? The first results from the Alpha Magnetic Spectrometer (AMS), which is an experiment operating in orbit on the International Space Station (ISS), have been released. It’s been two years since the delivery via Space Shuttle to the ISS (in May, 2011) of the AMS-02 instrument, which was especially designed to explore the properties of antimatter. And it’s been a long time coming to get to this point, since the experiment was first proposed in 1995 by the Nobel Prize-winning M.I.T. physicist, professor Samuel Ting. A prototype instrument, the AMS-01, flew in a short-duration Space Shuttle mission in 1998, and had much lower sensitivity. Over 16 countries across the globe participate in the AMS mission, and the instrument underwent testing at the CERN particle physics research center near Geneva and also in the Netherlands before being launched from Cape Canaveral, Florida. The lifetime of the mission is expected to extend for over 10 years. 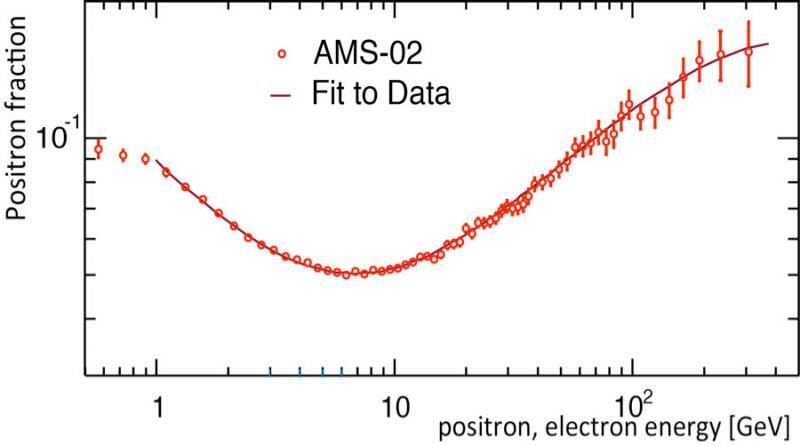 In this first data release, with over 30 billion cosmic rays detected, the AMS has detected among these over 400,000 positrons, the positively charged antiparticles to electrons. This is the most antimatter that has ever been directly measured in space. It is hoped that the AMS can shed light on dark matter, since one of the possible signatures of dark matter is the production of positrons and electrons when dark matter particles annihilate. This assumes that some type of WIMP is the explanation for dark matter, WIMP meaning a “weakly interacting massive particle”. Weakly interacting signifies that dark matter particles (in this scenario highly favored by many physicists) would interact through the weak nuclear force, but not the electromagnetic force. Which basically explains why we can’t easily detect them except through their gravitational effects. Massive particle refers to a particle substantially more massive than a proton or neutron, which have rest masses of just under 1 GeV (1 giga volt) in energy terms. A WIMP dark matter particle mass could be 10 to 1000 times or more higher. The lightest member of the neutralino family is the most-favored hypothesized WIMP dark matter candidate. The figure below shows the positron relative abundance versus energy, based on 18 months of AMS operational data. The energy of detected positrons ranges from 1/2 GeV to over 300 GeV. The abundance, shown on the y-axis, is the fraction of positrons relative to total electrons and positrons detected at a given energy. The spectrum shows a clear trend to relatively fewer positrons as the energy grows to 10 GeV and then a substantially increasing relative number of positrons at higher energies. This general shape for the spectrum was seen with previous experiments including Fermi, Caprice94 and Pamela, but is much clearer with the AMS due to the higher resolution and significantly greater number of positrons detected. It is particularly this increase in positrons seen above 10 GeV that is suggestive of sources other than the general cosmic ray background. So what is the source of the energetic positrons detected by the AMS? Some or all of these could be produced when two dark matter WIMP particles meet one another. In the WIMP scenario the dark matter particle such as the neutralino is neutrally charged (no electromagnetic interaction, remember) and also its own antiparticle. And when a particle meets its antiparticle what happens is that they mutually annihilate. The energy of the pair of colliding dark matter particles is transformed into lighter particles, including electron-positron pairs and energetic photons including gamma rays. Another likely source is pulsars, which are rotating neutron stars with magnetic fields. Since neutron stars are compact and rotate quickly, and their magnetic field strengths are high, electrons and positrons can be accelerated to very high energy. In particular, the Geminga pulsar is the closest energetic pulsar and has been suggested as a major source of these extra positrons. More data is needed, especially at higher energies above 100 GeV. Over the next few years as AMS continues to operate and the number of positrons detected climbs to 1 million and above, this spectral shape will be better determined. And as the shape of the high-energy portion of the spectrum becomes clearer, it will help elucidate whether dark matter or pulsars or something else are the primary source of the positrons. You can follow AMS-02 on Facebook here.